Evidence of mass graves and systematic mass killing of civilians in South Kordofan, Sudan has been mounting. 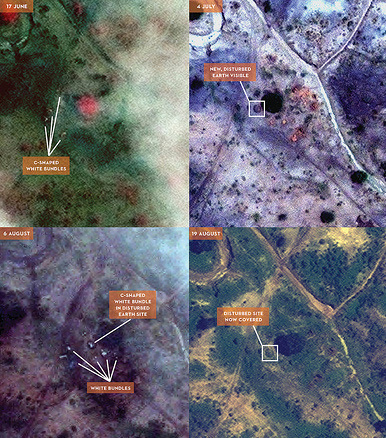 The latest report by Satellite Sentinel Project, or SSP, released today confirms with visual evidence and new eyewitness reports the collection and burial of human remains in and around Kadugli, the capital of South Kordofan. The report presents evidence of two additional mass graves in the area—bringing the total number of alleged mass graves to eight thus far. Statements and press releases by the International Federation of Red Cross and Red Crescent Societies, or IFRC, the Sudan Red Crescent Soicety, or SRCS, and the International Committee of the Red Cross, or ICRC, have confirmed that mass body recovery and disposal operations have been operating in Kadugli. A 1 July report released by IFRC verifies that the SRCS, reportedly acting on instructions from the Government of South Kordofan, has been ac­tively collecting dead bodies in Kadugli town, and had at least 415 body bags and 2,000 plastic tarps recently transferred to it from the IFRC prior to the fighting in June. By the end of June, the SRCS was publicly saying it needed more body bags. In addition to blatant denials, President of Sudan Omar Hassan al-Bashir has banned foreign organizations from entering South Kordofan, stating that aid will be delivered only through the Sudanese Red Crescent Society. As the Government of Sudan and President Bashir continue to emphatically deny its involvement of mass killing in South Kordofan, numerous eye witness accounts and eight mass graves prove otherwise.